Nuking Politics: Where'd Everybody Go? 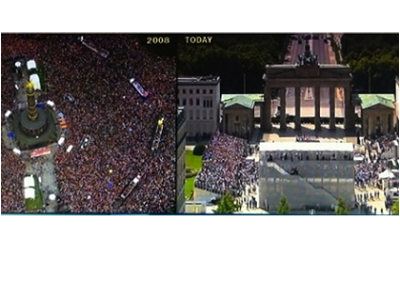 In 2008, Obama went to Berlin, and made a speech at the Brandenburg Gate. A huge crowd of about 200,000 showed up. This week he did it again. Same basic speech, same place, but the crowd size this time was between 4,000 and 4,500, and almost half of them were Michelles' private staff, chefs, hairdressers, wardrobe consultants, etc. In the course of 5 years 98% of that original crowd figured out that the man they went to see was an empty suit with a teleprompter. What happened? Could it be that the Germans are that much smarter than we are? Or maybe it's just because they haven't been sufficiently schmoozed with freebies, social programs, redistribution schemes, or Obamaphones. Half the people in this country show no signs of coming to their senses. If they ever do, this is what will happen to Mr Obama's crowd sizes here. This has already happened to his crowd sizes here: remember, they had to move people into the indoor arena at the convention, from the football stadium because there was a "slight chance of rain." He couldn't fill a decent sized theater during the campaign. His appeal has waned to a great extent. He won the election by demonizing Romney and promising free stuff to people. That's all true, still half the country voted for him. Makes you wonder, huh? Obama won in '12 because the Republican base stayed home.